England's domestic T20 competition returns on Friday with, as England and Surrey opener Jason Roy describes it, "some serious firepower". Twenty20 cricket in England and Wales has sparked plenty of debate this year, with a new city-based eight-team tournament getting the nod for 2020. But for now, the T20 Blast is king. Star names from overseas and home shores are set to feature and the majority of games will be played at the height of summer. BBC Sport takes a closer look at how things are set to pan out over the next couple of months. Can Northants make it four out of five? 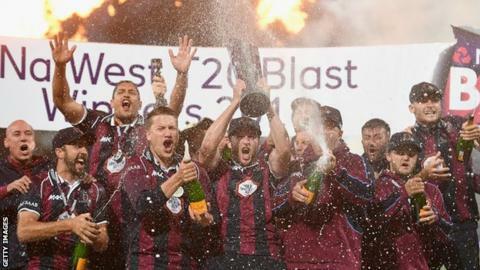 Defending champions Northamptonshire Steelbacks go into the competition having reached Finals Day three times in the last four seasons. In 2016, Alex Wakely's side beat Durham by four wickets in the final - guided by Josh Cobb's innings of 80. The Steelbacks may have fewer star names than some of the other counties, but still have a number of potential match-winners such as explosive openers Ben Duckett and Richard Levi, destructive all-rounder Rory Kleinveldt and South Africa's mystery spinner Tabraiz Shamsi for three games. "We've kind of used the underdog tag quite a bit, I think it's run past its sell-by date now," head coach David Ripley told BBC Radio Northampton. "We're recognised as a good team, we are a good team, we've always known that, but it's been nice to be under the radar a little bit. "Derbyshire will be absolutely sprinting down the M1 to take us on on Friday and show they can beat the champions, and we've got that to deal with through all our group games." Captain Alex Wakely added: "We're Northampton - people always write us off. The teams don't but the pundits often do. "We're backing ourselves. We've got pretty much the same team as last season. It's a format we know really well and we've got guys in good form. "We've got a lot of experience and guys who have played all over the world. It's about winning the crucial moments, there are always one or two during these matches and you have to win those to go far in the tournament." Favourites Surrey begin their campaign with a mouth-watering match against Essex Eagles under the lights at Chelmsford on Friday. The One-Day Cup finalists have an array of international talent including England's Roy and recently-capped Tom Curran, Australia pair Aaron Finch and Moises Henriques and Sri Lanka legend Kumar Sangakkara. Former England batsman Kevin Pietersen also returns on 19 July. "The team we have on paper is extremely exciting so hopefully we can light up a few games," Roy, 26, told BBC Radio London. "There's some serious firepower - it's a great experience to share the field with people who have done it on a big stage and done it so often and been successful doing it. "There's no difference between an international game or our T20 nights. The crowd is phenomenal, the fireworks, the music, they do it really well. It lifts us a huge amount. To have 24,000 people going berserk, it really does up your game." The competition is split into two groups - North and South - and each team plays 14 matches in the group stage. Sides will play home and away against six opponents and face two teams just once. The group stage is played in a six-week block, starting on Friday and finishing on 18 August, with the majority of matches from Thursday until Sunday. All four quarter-finals are played in the week starting Monday, 21 August before Finals Day takes place at Edgbaston on Saturday, 2 September.